Are you looking to buy or sell plastic extrusion machines? Then Arlington Plastics Machinery is the one-stop shop you need! For more than 25 years, we've been purchasing, storing, refurbishing, and selling used plastics machinery of all varieties—including full plastic extruders and individual extrusion machine parts. Single Screw Extruders: Our inventory of single screw extruders are high-quality machines capable of producing the final plastic product. The in-stock single screw extruders come in numerous dimensions and are available in air or water cooled. Single screw extruders work by having one screw operate with a cylinder to heat and combine the materials and force the material through the die to form the final product shape. Twin Screw Extruders: Twin screw extruders are used for compounding, when special colors or different properties need to be added to the plastic materials. This type of plastic extrusion machinery allows the mixing of different materials in order to create a certain color or property of the plastics. Twin screw extruders have a broad range of applications across any industry that deals with plastics, such as the chemicals, packaging and automotive industries. 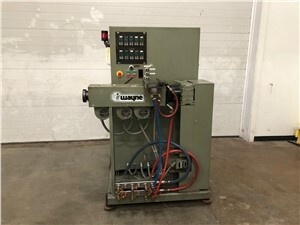 At Arlington Plastics Machinery, we boast one of the largest inventories of plastic extruders. Our single and twin screw extruders are available in both air- and water-cooled designs and come in various configurations, screw diameters, and power specifications. They're also made by several top-name manufacturers to allow you to choose a model that suits your application at a price that still fits your company's budget. Whether you're producing solid machine shop parts, hollow PVC tubing, or wire insulation, we're sure to have an extruder that fits your specific needs. 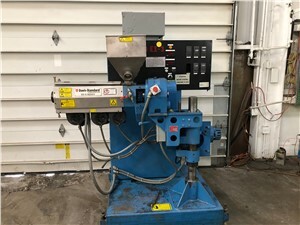 If you don’t know which style of plastic extruder is right for you—or if you’d like to sell your used plastic extrusion machines—don’t hesitate to contact Arlington Plastics Machinery today! Our staff would love to hear more about your needs and recommend the right piece of equipment for you. With a huge stock of extruders and ancillary plastics equipment, very competitive pricing, and a team of industry experts, we're here to help your manufacturing process. Call us to speak with a representative, or add the extruder you're interested in to receive a free, no-pressure quote within 24 hours!